It's shorts season, guys. Looking for the right cut and length? Our guide has the quick answer to the best shorts for your build. For starters, fit shouldn’t only be based on your height. It’s an easy mistake to make. 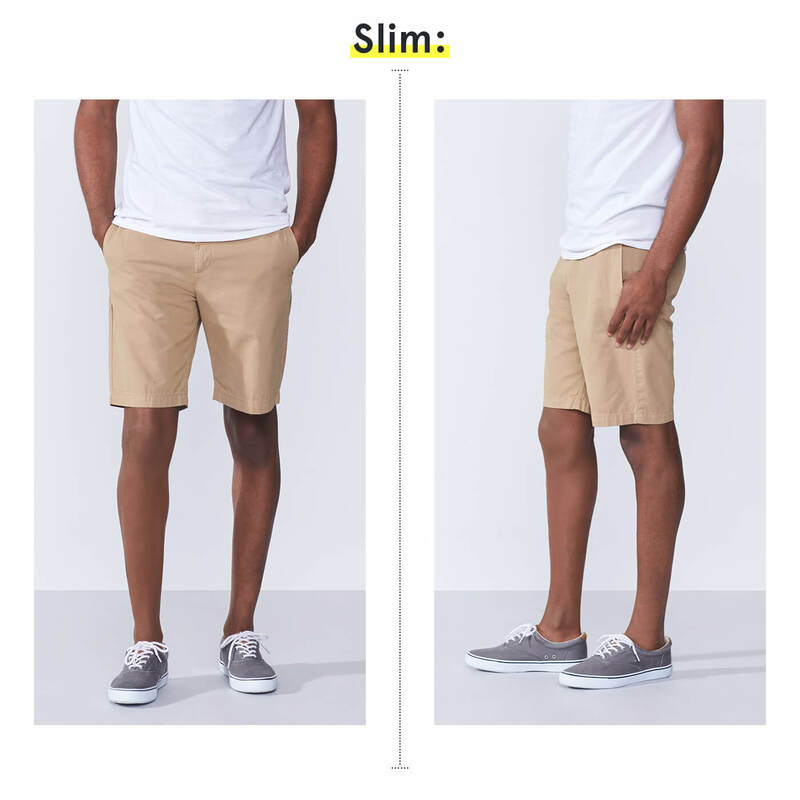 The perfect pair should factor in a few things: your leg length (think: your denim or pant inseam), leg width (the cut of the leg opening) and torso length (upper body). 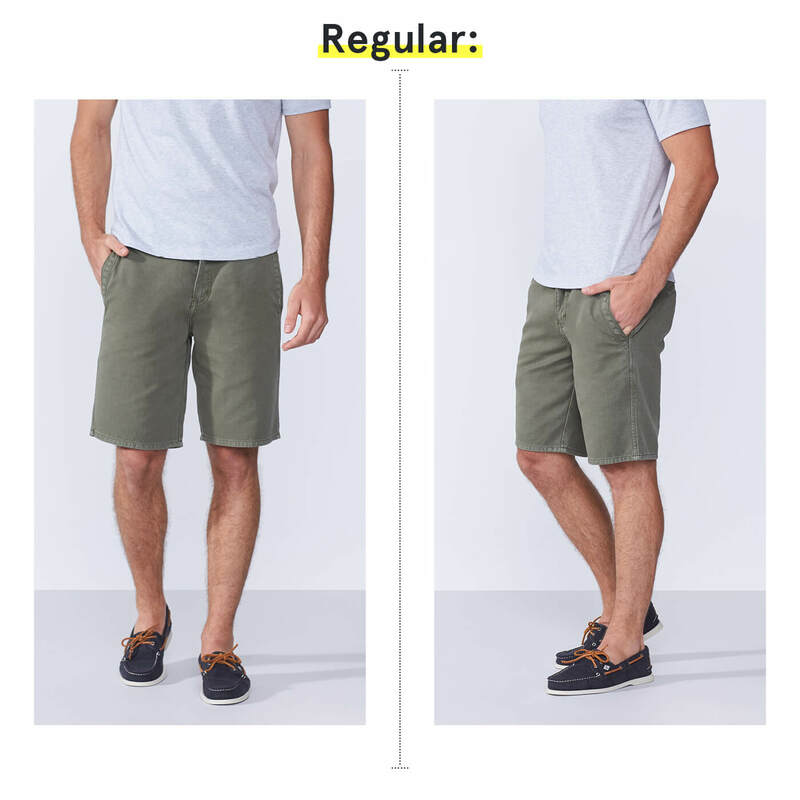 As a general rule, shorts should extend to either right above or right below your kneecaps—regardless of body build—based on your personal preference. This inseam ranges from 10” or more. We recommend this style for huskier builds because it will elongate your frame. Avoid going too long—it will make you appear shorter. This inseam ranges from 9–10” or so. As the name says, this will hit just above the knee. Most shorts fall within this range and work for pretty much all body types. This inseam ranges from 7–9” or less. This will hit just a few inches above the knee. Lengthwise, think of your typical pair of boxer briefs with legs. This works best for regular, athletic and slimmer body types. This inseam ranges from 5–7” or so. This will hit a little below the midway point between your knee and hip. Lengthwise, think of square cut swim trunks. This style best suits slimmer body types. This inseam ranges from 4” or less. You’d be approaching hotpants range. Unless your shorts game is at its peak or you’re strutting down a runway, leave this one to the professionals. Since regular body types have balanced proportions, you have more wiggle room to experiment with different lengths. But, if you come across shorts that run past your knees, keep it moving. You’re safe with anything that hits just above the knee. Since you’re so proportional, you’ll want to keep your shorts that way. That being said, you can play with different lengths and styles. Plan around 8 inches or anything that hits just above the knee. “The longer you go, the shorter you appear and run risk of throwing off your natural balance.” — Stylist Tiffany R.
Skip relaxed shorts styles. They can overwhelm your bottom half, especially if you’re wearing a slim fitting shirt. Don’t be afraid to be your own tailor. If you like that pair that’s a bit too long (they may be really comfy; we won’t judge)―roll the cuffs up a bit and see how they look in a mirror. 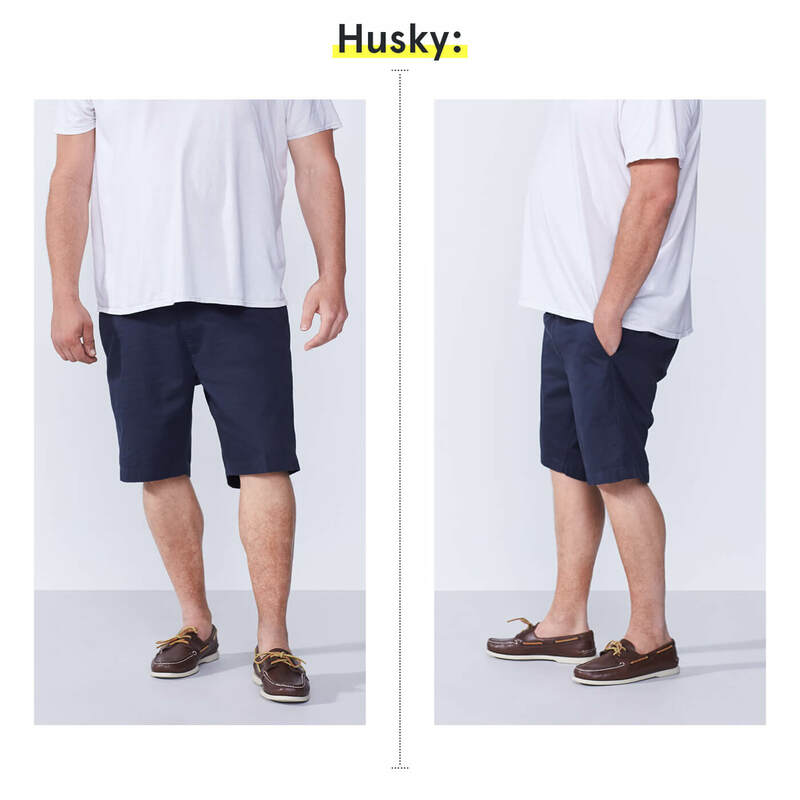 For the guy with a husky build, choose shorts that aren’t too wide or too tight through the leg. You’ll want a longer inseam here to offset a broader frame. Look for something at your knee or just below it. However, going too long will make you appear shorter. You can go up to 10” here if it doesn’t drop too low. “I suggest going with a longer inseam to lengthen your frame. Go up to a 10” inseam that hits you at or just below the knee.” — Stylist Tiffany R.
Embrace the same fabrics used in your favorite pants and jeans. Shorts with some stretch can help bigger guys seeking a slimmer fit. Be sure to stick with neutral colors, like navy and gray, to streamline your look. If prints and patterns are your jam, select those that are smaller. Steer clear of distressed styles. Certain details, like rips or holes, can draw attention to your midsection. Narrow your focus. Slim shorts can make a larger guy appear smaller. You have the flexibility to go with a higher rise, depending on your style preferences. Be aware that shorter options will make you appear taller. Wear them a little high, wear them a little low—it’s really up to you. Experiment with different lengths and styles based on your outfit. If you’re looking for a shorter short, go with a 5” inseam or so. If longer suits you, stick closer to 7” or so. “I recommend wearing shorts that fit your body type. Tailored, slim-cut shorts balance out your proportions.” — Stylist Tiffany R.
Avoid loose-fitting tops. Pieces like baggy hoodies can call attention to your legs. 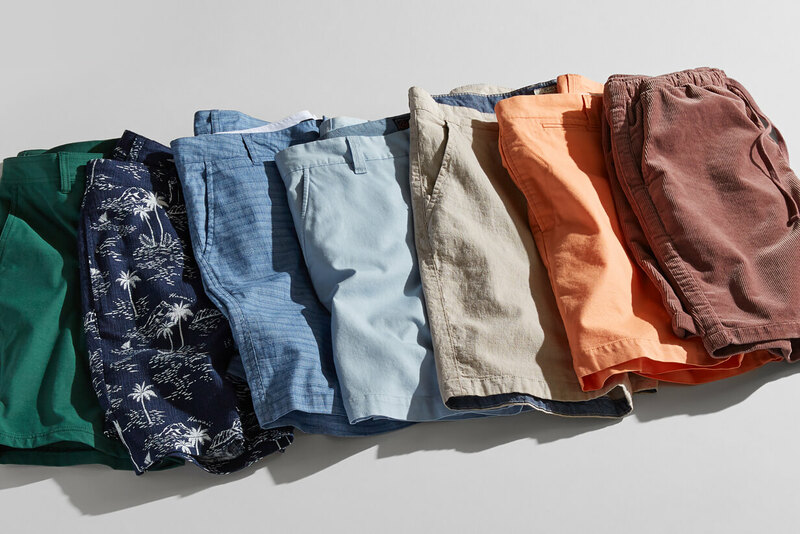 Opt for lighter-shade shorts. Darker colors will minimize your overall look. Drop the weights and back away from the oversized cargos. Yep, those. You spend hours in the gym, so why cover up that hard work? The biggest misconception muscular guys have is that they need to wear baggier clothes. 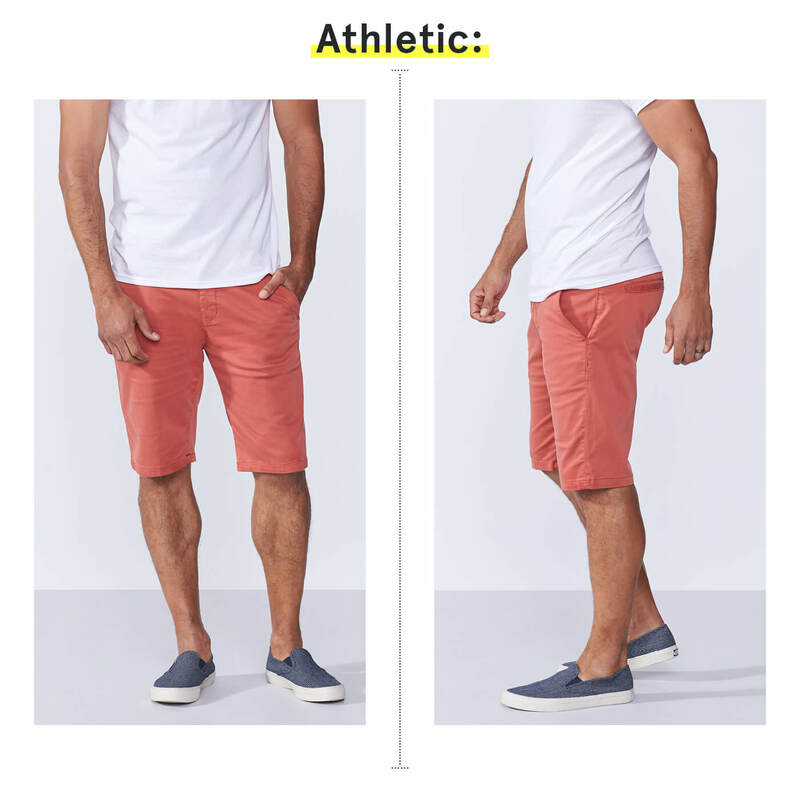 Guys, fitted shorts aren’t just for fashionistas. Not only do they complement your gains at the gym, they also even out the proportion of your appearance. Stick to a regular length around 8” and avoid anything that broadens your frame. “Our Stylists recommend shorts in a regular, classic cut to show off your definition.”— Stylist Tiffany R.
Go for range of motion. Try out shorts with built-in performance fabric for more stretch. Avoid skinny shorts that will make your build appear wider. Fitted doesn’t mean tight. 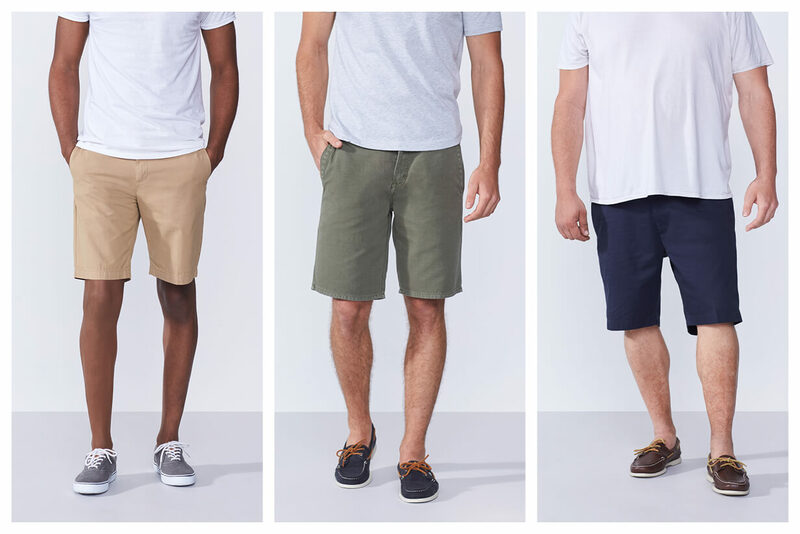 Now that you’ve got the rundown on how to wear shorts, let your Stylist find the right pair for you. Request shorts in your next Fix.